Large and small orchards have been planted by Eco Tree Care & Conservation Ltd. Apart from our private customers we have worked with community groups, school children, schools for people with learning difficulties and commercial farms. 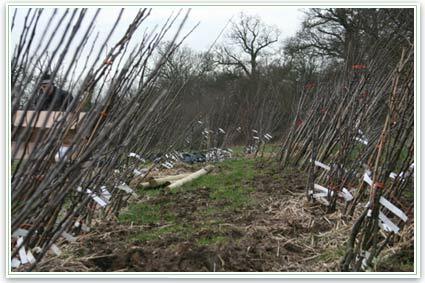 We planned the new public orchard at the Woodland Trust's flagship Heartwood Forest at Sandridge, Herts and were supplying the fruit trees for the community planting days. 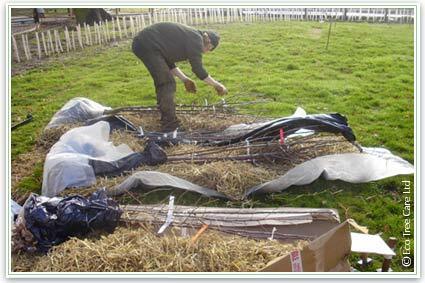 Apart from experience and expertise in Orchard Planning we importantly had developed a good relationship with just a handful of high quality suppliers. Just as important, perhaps more so, we know which suppliers to avoid! 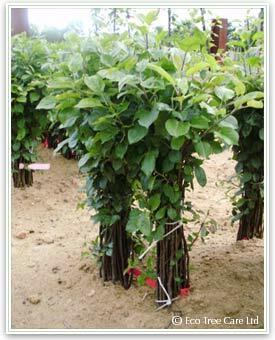 Good quality trees that are disease free, on healthy rootstocks with problem-free grafts is paramount, as is correct labelling and careful packing and delivery. All our suppliers had these attributes and we had developed strong trusting relationships over time. 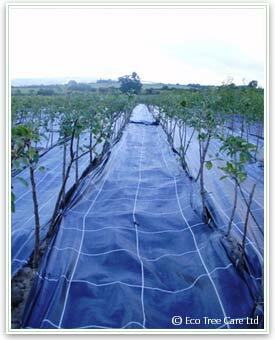 Apart from our experience and knowledge of orchard planning and the network of experts and suppliers. We had an experienced work force. 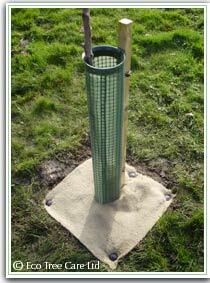 Eco Tree Care & Conservation Limited not only planted orchards, we planted woodlands, native hedges and specimen trees. Plant handling is very important, our work force knew how to treat bare-root trees from unpacking the delivery, to heeling in if necessary, through to planting and finally tree protection and mulching. All our planting projects employed Mycorrhizal Inoculation, a technique of introducing beneficial fungi to roots at the point of planting. Inoculation is done by using a freshly prepared mix everyday of Mycorrhizae and Hydrogel, which creates a wallpaper-like paste that adheres to the roots prior to planting. Not only does the mixture contain the beneficial Mycorrhizal fungi, the hydrogel also provides the roots with a water absorbing and retaining environment whihc helps against drought stress. 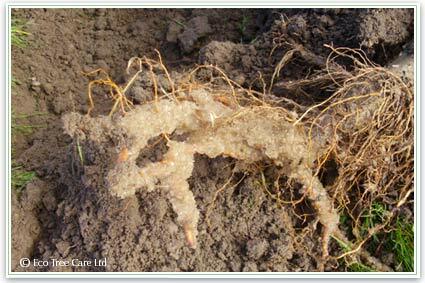 See the Mycorrhizal Inoculation and Mycorrhizal Inoculation - The Biology web pages for more in depth information. Church Farm - In the summer of 2007 we were commissioned to plan and plant a community farm orchard in Ardeley, near Stevenage. The orchard was to be called Vicars Orchard and its scale and complexity was immense. In the late winter into early spring of 2008, together with local school children, our experienced team planted over 700 fruit trees with in excess of 130 different varieties. After planting we carried out formative pruning on all the apple trees to develop their branch structure. 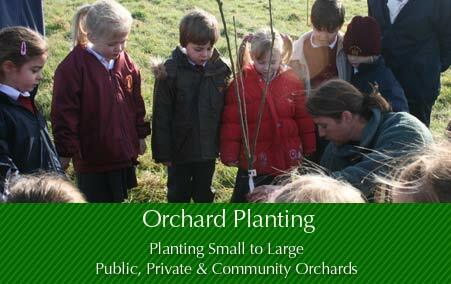 We also planned and planted a 2 acre Walnut Orchard at Church Farm. This orchard is just a small part of a wider enterprise to revive community farming to this corner of Hertfordshire. Freya North - In 2009 the best-selling author, Freya North, asked us to plan and plant a small family orchard at her new home. We worked closely with her to decide on the varieties and fruit types. We planted 5 Dessert Apples, 1 Cooking Apple, 1 Quince, 3 Plums, 2 Damsons and 2 Gages. Heartwood Forest Orchard for the Woodland Trust - We are a member of the Hertfordshire Orchards Initiative (HOI) and through this association and because of our experience planning large orchards, Eco Tree Care & Conservation Ltd were asked by the Woodland trust to plan and design a new extensive community orchard at Sandridge near St Albans in Hertfordshire. This Orchard is in an area of about 6 acres and is just a small part of the ambitious project by the Woodland Trust to plant the largest new native woodland in England, and area of 850 acres. Although the planning and mapping of the Orchard is now complete, the Orchard planting is ongoing and will be taking place over the next 4-5 years until about 2016 involving the local community.